When everything is going wrong, it is easy to forget that God is in control and is blessing our lives. 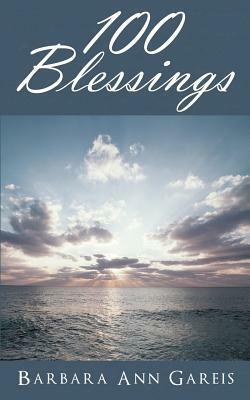 In 100 Blessings, Barbara Ann Gareis tells her story of overcoming tragedy by remembering the good things in her life. She describes times of illness, loss, and financial difficulties alongside verses of encouragement from the Bible. Later in the book, she writes about the men and women of the Bible who went through times of trial - Job, Ruth, Joseph, David, Abigail, and Daniel. This slim book is perfect for a quick bout of encouragement as we are reminded that even when circumstances are against us, God is with us. In 100 Blessings, Barbara strikes the perfect balance between digging deep into the Bible and sharing things from her own life and experiences. She uses the story of Job to remind us to thank God for who He is instead of the good or bad things in your life. Ruth's commitment to God and her mother-in-law Naomi shows readers that God can use the broken-hearted for great things. In her own life, Barbara relates how she experienced God's blessings through her children, her friends, and even perfect strangers. Barbara finds that one way to offset the difficulties of life is to remind herself of the blessings in her life. She begins the practice of keeping a gratitude list. Her list of 100 blessings gives the book its title and contains things as monumental as the servicemen and police who keep her safe all the way to the small joys like cookies fresh out of the oven. There is even a place in the book to list your own blessings. 100 Blessings is a quick and encouraging read for the moments when it seems like your life is falling apart. Each chapter will remind you of a reason to be grateful or a character in the Bible whose life was radically transformed through pain or tragedy. Barbara Gareis reminds us that each of us go through trying times and there is comfort in the everyday blessings. Most importantly, she encourages readers with the knowledge that even in their darkest hours, God never forsakes them. Note: I know the author and she asked me to write a review. All opinions are my own. Thanks for the review. It's the little things in life that are encouraging. It is so easy to forget all of the good things, isn't it?? It's all about perspective...isn't it? Being thankful and recognizing blessings when life isn't going well is so important. (I just wish it was easier!) This sounds like a book that's good to have on your shelf for when life gets a little hard and you need a little hope and encouragement. Thanks!